You know the drill, Fortnite enjoys another week on top. Despite a 6.4 per cent drop in hits, the battle royale remains almost 20 million hours watched clear of the second game on the chart. League of Legends takes the second spot as usual, with a 5.3 per cent increase in views since last week. 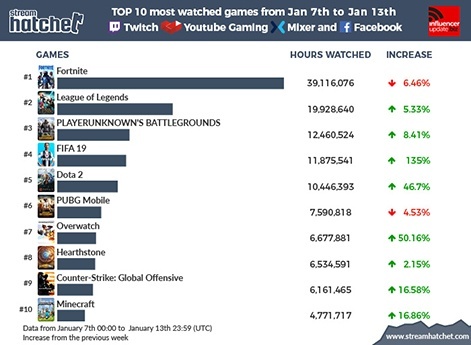 PUBG is in third again, with 12.4 million hours watched in the last week. FIFA 19 shoots up in fourth place this week, after dancing around the bottom of the chart for a number of weeks. EA's annual footy fest enjoyed a 135 per cent rise in hours watched last week. A result of that is Dota 2 falling to fifth place, despite a 46.7 per cent increase in views. PUBG Mobile is a new entry to the chart in sixth. The mobile-friendly version of PlayerUnknown's Battlegrounds racked up over 7.5 million hours watched last week. Overwatch takes seventh place with a 50 per cent increase in views, just as season 14 of the team-based FPS kicks off. Fellow Blizzard title Hearthstone is down to eighth place from fifth after being knocked down several pegs by the aforementioned titles. 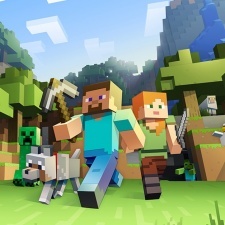 CS:GO is in ninth place with a 16.5 per cent increase in views, and tenth place is taken by a returning favourite - Minecraft. 10 years on from its initial release, the Microsoft owned title still brings in a cool 91 million active monthly users.